We have written much about the notion of inflation. We don’t want to rehash our many previous points, but to look at the idea of purchasing power from a new angle. Purchasing power is assumed to be intrinsic to the currency. We have said that the problem with the word inflation is that it treats two different phenomena as if they are the same. One is the presumed effect of rising quantity of dollars. The other is the effect of rising regulatory and tax burdens. Let’s use milk as an example. Suppose milk was per gallon. Many would say that a dollar is worth one gallon of milk. Or, alternatively, a dollar’s purchasing power is one gallon of milk. Suppose that later, the price of milk goes up to . Then, people say that the dollar’s purchasing power falls by 50%, to half a gallon of milk. We have written much about the notion of inflation. We don’t want to rehash our many previous points, but to look at the idea of purchasing power from a new angle. Purchasing power is assumed to be intrinsic to the currency. We have said that the problem with the word inflation is that it treats two different phenomena as if they are the same. One is the presumed effect of rising quantity of dollars. The other is the effect of rising regulatory and tax burdens. Let’s use milk as an example. Suppose milk was $1 per gallon. Many would say that a dollar is worth one gallon of milk. Or, alternatively, a dollar’s purchasing power is one gallon of milk. Suppose that later, the price of milk goes up to $2. Then, people say that the dollar’s purchasing power falls by 50%, to half a gallon of milk. Regardless of what you call it, everyone would agree that the dollar buys less than it did. Until now. Let us explain. One can think of production as buying a bunch of ingredients, and mixing them together in a certain way, to create the product. For example, milk comes from the ingredients of: land, cows, ranch labor, dairy labor, dairy capital equipment, distribution labor, distribution capital, and consumable containers. Next, the government decides that it wants dairy farmers to pay for its costs to inspect the tags and audit the tag tracking records. Add government inspector labor to the list of ingredients. Regulation after regulation is passed, controlling the use of land, the number and treatment of the cows, the workers, etc. etc. By the time all’s said and all’s done, the cost to produce a gallon of milk is ten times higher. Of course, the retail price of milk is not directly connected to the cost of producing it. If you doubt this, then maybe you will go out and buy a new BMW 750 and then tell your boss that now your cost of living is higher, and therefore your wage must go up! In all seriousness if milk producers could charge more, then they would already be charging more. A rising cost of production is the producer’s problem. However, no one can sell at a loss for long. So what happens in reality is that producers try to raise their prices. Some consumers are unable to buy milk at the higher price. Others are unwilling. The marginal milk buyer stops buying milk, and may switch to a substitute. The net result is the bankruptcy of some dairy producers, a decline in quantity of milk purchased by consumers—and much higher prices. In our example, the cost to produce went up by 10X. The price to buy milk will likely end up close to that (there are other variables that can affect price in a real economy, of course). In this light, we can see that it is not right to say that the dollar’s purchasing power went down 90%. The dollar is paying for just as much as it did, previously. It’s just that the things it buys are increasingly not the things that consumers care about (or even know about). Things like supersized Americans With Disabilities bathrooms for dairy workers, extra motel stays for milk truck drivers do to mandatory stops, forced vitamin D addition, special plastic jugs, taxes, fees, permits, licenses, etc. A lot of labor and capital goes into all this government-mandated stuff. If we look at each of them as an additional ingredient that is now necessary to produce milk, we can see that it’s not that the dollar went down. It’s that more ingredients went into the milk. Milk really went up. There are four points we hope that readers will take home from this. First, the term purchasing power suggests something that is untrue. It suggest that the quantity of milk that can be bought for a dollar is intrinsic to the dollar, and has nothing to do with what goes into producing milk. Two, whatever the word for forcing milk producers to add more and more useless ingredients may be, that word should not be the same as the one that refers to monetary debasement. Three, people should demand the repeal of laws that force milk producers, and car producers, and home producers, and every other kind of producer, to add ingredients that increase the cost without increasing the value. And four, the Federal Reserve deserves the blame for many ills, but this is not one of them. Add this to the list of reasons why the dollar cannot be measured in consumer prices, why it is not proper to say that a dollar is worth one tenth of a gallon of milk. If you read gold analysis much, you will come across two ideas. One, inflation so-called (rising consumer prices) is not only running much higher than the official statistic, but is about to really start skyrocketing. Two buy gold because gold will hedge it. That is, the price of gold will go up as fast, or faster, than the price of consumer goods. Well, consumer prices are not rising as a consequence of monetary policy. If they’re rising, it’s despite the falling interest rate, and due to the government constantly forcing producers to add more and more ingredients to the production of everything. 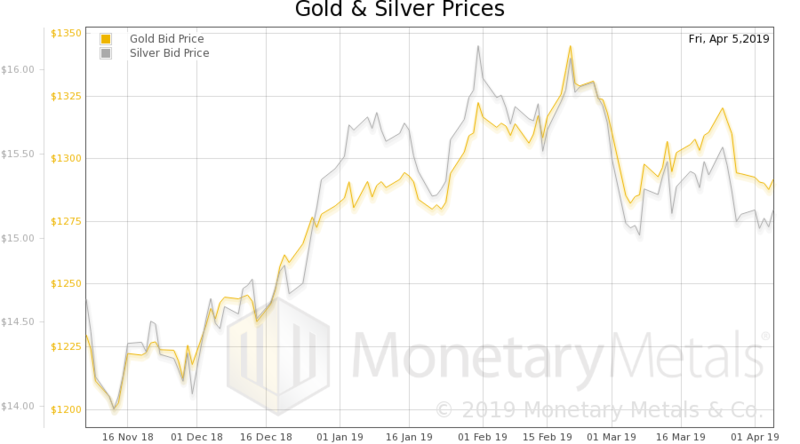 In the long term, the price of gold will move as the people (not merely leveraged speculators amped up on the latest Internet rumor) perceive that the dollar’s demise draws near. 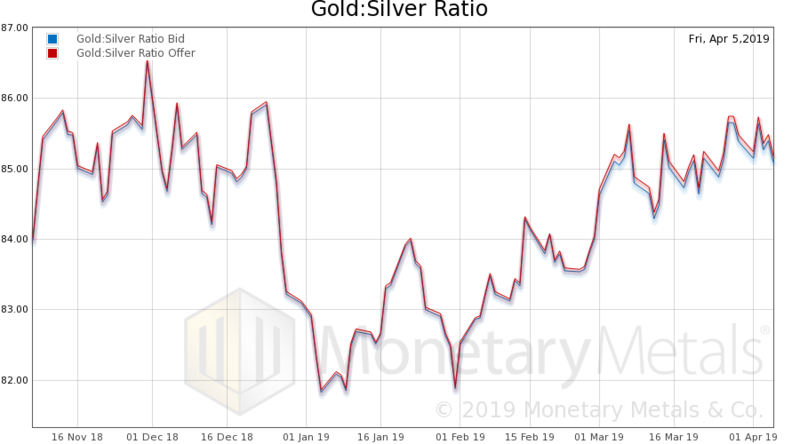 Or as gold’s utility grows, after an 85-year government-imposed hiatus. To put this in perspective, in 11 years these companies collectively added $387B in debt. But they grew earnings by only $98B. The marginal productivity of this debt—here used to mean change in EBITDA per dollar of added debt—is $0.25. This not only makes these companies more brittle, more vulnerable to a downturn. But, there is another problem. 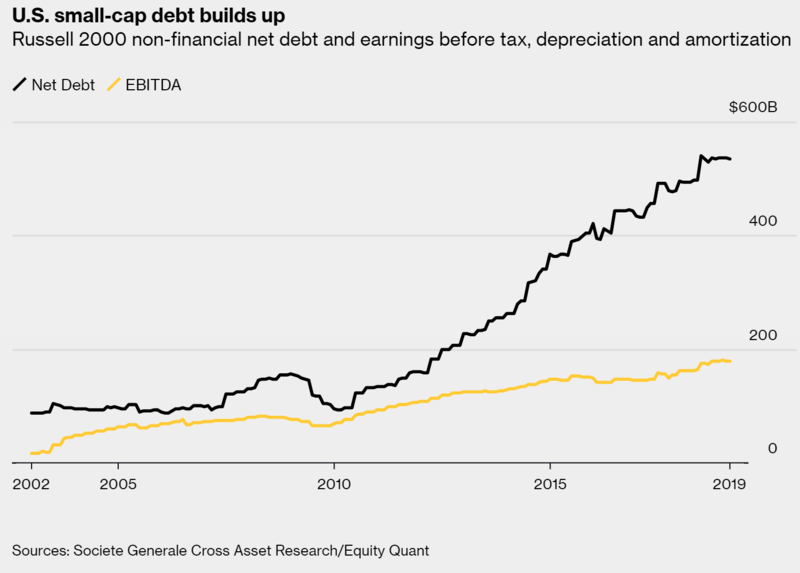 Each one’s added debt comes to other companies (including many Russell 2000 companies) as revenues. This means that when credit tightens again, revenues will drop as a direct consequence of one firm’s cessation of borrowing to buy the products of another (or pay its employees’ salaries, which are spend on the products of another). There is a synergistic effect at work here. It’s great fun on the way up (and politicians all around the world love to take credit for it). And it will be great pain on the way down. The scarcity (i.e. cobasis) as measured by the June contract rise a bit. 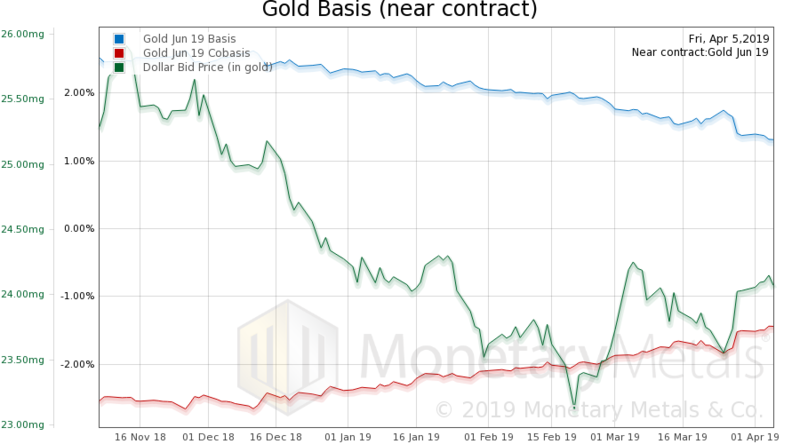 However, the gold basis continuous dropped a bit. 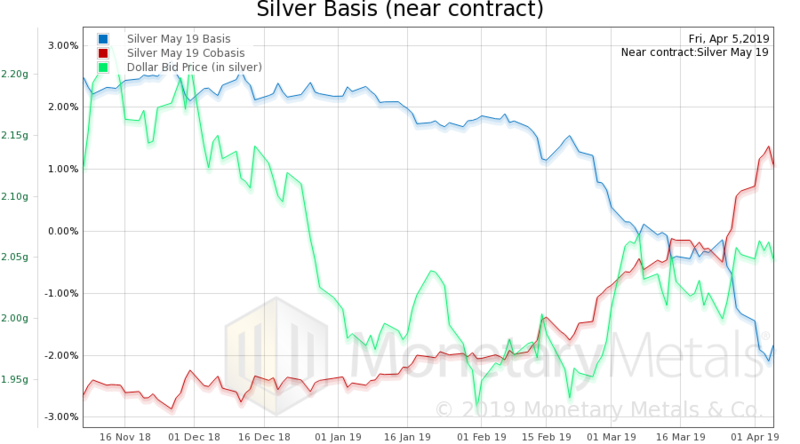 So this week there was some selling of metal and buying of futures.